In the 14th Century a performing art called sarugaku was favored by many of the common people. Sarugaku had both religious and entertainment aspects and was performed in temple or shrine precincts attached to religious ceremonies there. Eventually, as sarugaku grew popular with the administrators and cultured people of the capital, Kyoto, it reached a high artistic level inherently expressing Japan’s spiritual nature, transforming into an entertainment art creating an aesthetic world. Since the 19th century this sarugaku came to be called noh. Although noh, based primarily on ancient literary works, was created in the 14th~15th centuries, it has been performed continuously since that time. Noh has continued for over 650 years for the simple reason of the appeal it holds to attract people of any era, its themes never growing old. Currently, noh is usually performed at theatres expressly for the purpose of performing noh called nohgakudo. 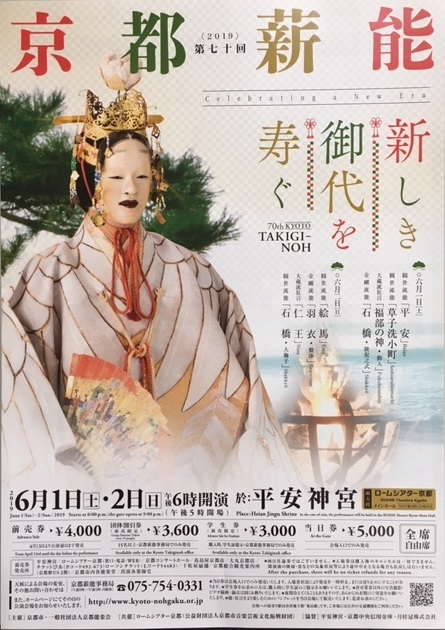 The Kyoto Takigi-noh was started in 1950 for the purpose of enjoying the atmosphere of the past and is associated with the torchlit noh performances held at Tofukuji Temple in Nara in medieval times. Held every year, it has become an event representing summer in Kyoto. Coming here, you can enjoy a Kyoto summer evening. As in the past, a stage has been constructed in the shrine precincts and lighting is provided for the performance by bonfires lit from a pure, sacred flame. Please enjoy the performance this early summer evening, becoming one with the surrounding environment and nature in the gradually changing light.